SEMA (Specialty Equipment Market Association) was founded in 1963 by a small group of manufacturers producing automotive performance parts. This association was formed to set standards, promote the industry and develop programs that would support aftermarket products. The organization has expanded to include additional interests of its members � government legislation, foreign trade, education, market research, etc. And, the membership has grown to comprise all aspects of the business which now includes retailers, warehouse distributors and publishing companies. To bring the stakeholders from the performance aftermarket together the first trade show was organized in 1967. 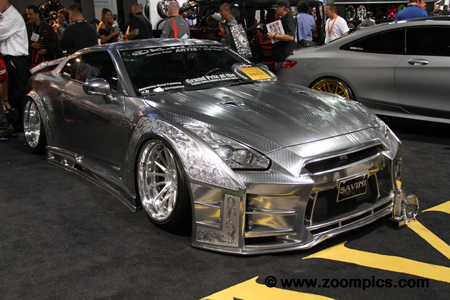 The event was held in Los Angeles � it attracted just under 100-manufacturers and approximately 3,000 attendees. In 1977, the SEMA Show moved to Las Vegas which was better equipped to handle the growing requirements of manufacturers and attendees. Today, the show, at the Las Vegas Convention Center (over a million square feet of floor space), boasts over 2,400 exhibitors and more than 150,000 people with ties to the automotive performance aftermarket. Visitors can see the hottest automotive products and attend demonstrations, educational seminars and special events. This BMW attracted a lot of attention at the 2015 SEMA show. This E28 (5 Series) has been lowered and sports a couple of different styles � the Rat Rod look combined with a Group 5 Touring Car appearance. The rusty body is mounted to a tube frame chassis. Powering the car is an S38 in-line six-cylinder engine from a BMW M5 which is located behind the centerline of the front wheels. This creation is called �Rusty Slammington�. 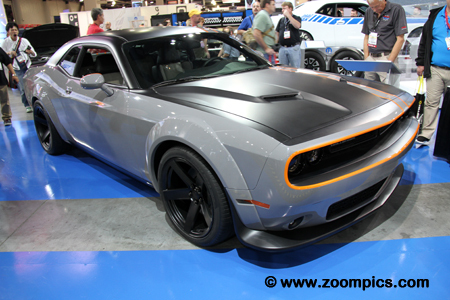 Chrysler brought this Dodge Challenger to SEMA. The paint scheme and fender flares make this an eye-catching car but it is want you can�t see that sets this vehicle apart from other Challengers. This Dodge is powered by a 5.7-liter Hemi V8 which produces about 515-horsepower. But what makes it unique is the All-Wheel-Drive system which uses components from a Chrysler 300 and police version of the Charger. 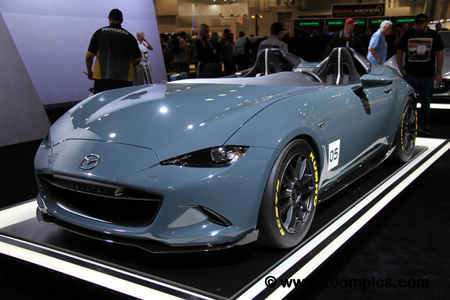 This Mazda MX-5 concept car appeared in the Mazda booth and was called the �MX-5 Speedster�. In an exercise to remove weight from the car the roof and windshield have been removed and the doors and seats have been replaced with carbon fiber. This MX-5 is 250-pounds lighter than the showroom version. To enhance the vehicle's performance, Mazda has replaced the brakes with vented rotors and Brembo calipers. The Optima Battery Ultimate Street Car Challenge consists of eight qualifying events around the U.S. which culminates with more than 50 of the world's most incredible vehicles battling for top honours at Las Vegas. One of these cars was this 1964 Plymouth Valiant built by the new formed Skunkworks Racing Division of Hot Rod Chassis and Cycle. The Plymouth which called Violent features a 528-cu.in. engine. The Datsun 1600 Roadster (SP311 / SPL311) was manufactured from January 1965 to April 1970. These cars rolled off the assembly line with a four-speed manual transmission and a 1.6-liter (R16) engine. This beautifully 1967 Roadster has received an engine transplant and is fitted with a Nissan SR20VET. And, as the car appeared in the Garrett booth it was equipped with one of their turbochargers � producing 500-horsepower. Several Rauh-Welt Begriff (RWB) modified Porsches appeared at the SEMA show. RWB is a tuning company located in Japan that specializes in Porsches. The unique look which combines Japanese and European styling elements was conceived by Nakai-san. Each car he builds is unique and custom tailored to the client. The most apparent change to these vehicles is their appearance but they also receive performance upgrades. 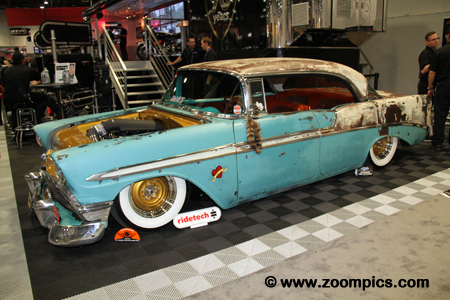 Another company well represented at the 2015 SEMA show was Welder Up which is located in Las Vegas. 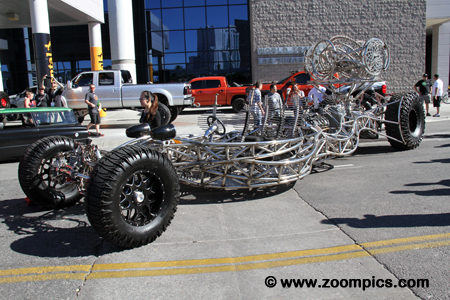 Steve Darnell and his employees appear on the Discovery Channel�s �Vegas Rat Rods� television show. 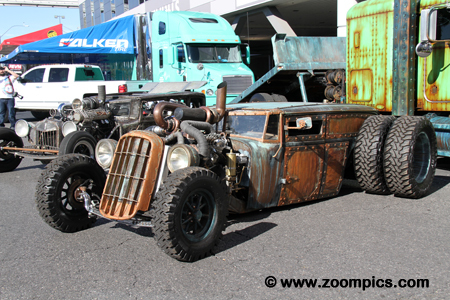 Most of the creations by Darnell and his staff are diesel-powered Rat Rod trucks. The creation pictured is called, Train Car. 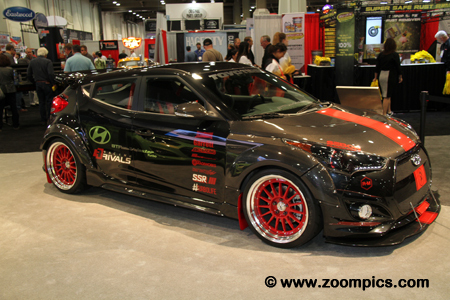 Blood Type Racing (BTR) modified this Hyundai Veloster. Introduced in 2012, the turbocharged Veloster is powered by a 1.6-liter T-GDi Gamma engine which produces 201-horsepower. By adding a larger turbo, new pistons, connecting rods, intake manifold, exhaust system. An intercooler and electronic control module BTR increased the car�s output to 500-horsepower. The Veloster also received new wheels and bodywork. This is another 500-horsepower Hyundai. 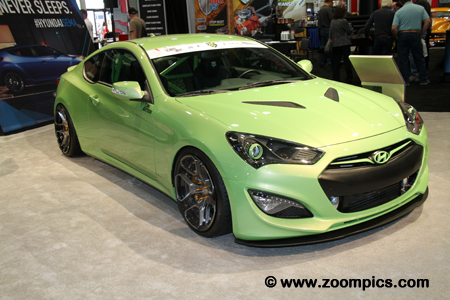 The Hyundai Genesis Coupe was introduced to the North American market in February of 2009 but sold as a 2010 model. The car was powered by a Theta 2.0-liter TCi engine or a Lamba 3.8-liter GDI V6. This Tjin Edition Genesis used the 3.8-liter motor and to increase the output it was fitted with a Vortech supercharger kit, intercooler and a new exhaust system. The Grave Digger Monster Truck is the brainchild of Dennis Anderson. Based on a 1950s panel truck, Anderson built his first creation in 1982 � since then there have been thirty-four versions of Grave Digger. The truck�s chassis is a tube-frame design and uses a 540-cu.in. engine which produces approximately 1,450-horsepower. The huge tires are from BTK, a manufacturer of Agricultural and Industrial tires. This 2015 Lexus RC F has received the full-treatment compliments of Gordon Ting at Beyond Marketing. 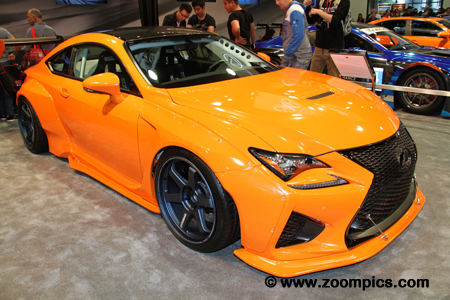 The aero modifications are an RC F wide-body kit from Pandem Custom which has been wrapped with 3M�s Gloss Burnt Orange vinyl. The tires are Bridgestone Potenzas mounted on Volk Racing TE-37 Ultra wheels. To improve the performance the Lexus has a GReddy Supreme exhaust system and AFE Takeda intake. Viewers of the Discovery Channel�s �Street Outlaws� will immediately recognize �Farmtruck�. 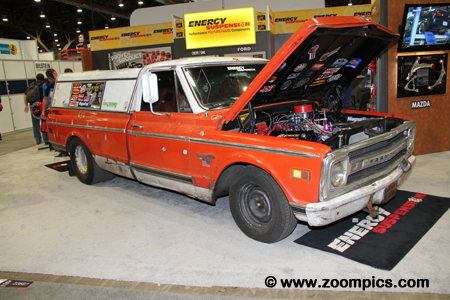 Farmtruck is the �ultimate sleeper� which appeared in the Energy Suspension booth. The truck is owned by Sean Whitley and maintained with help from AZN. This 1970 Chevrolet C-10 features well-worn paint and camper shell full of dents to lure the unsuspecting. Under the hood is a big-block Chevy engine with two-stage nitrous. 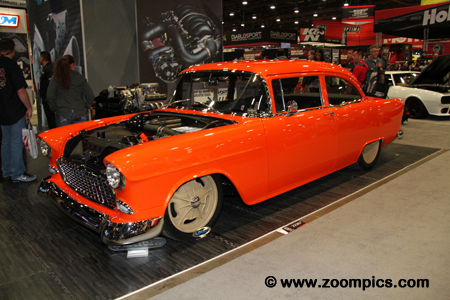 This 1955 Chevrolet was built by Ironworks Speed and Kustom. Located in Bakersfield, California the company is responsible for many beautiful creations. The car has been given a General Motors LSX376-B15 crate engine. Added to the motor is a V-20 Vortech Supercharger. 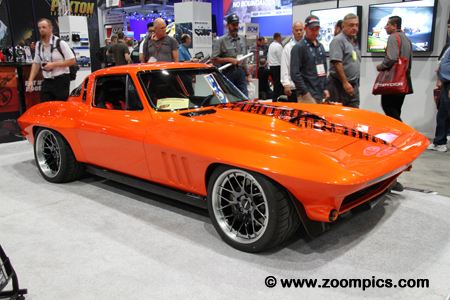 The chassis uses suspension components from a C6 Corvette and the wheels are one-offs by Evod Industries. The orange paint is called, Haterade. This custom is by the legendary car builder, Gene Winfield. Winfield�s talents have been used by Detroit, the entertainment industry and even toy companies. 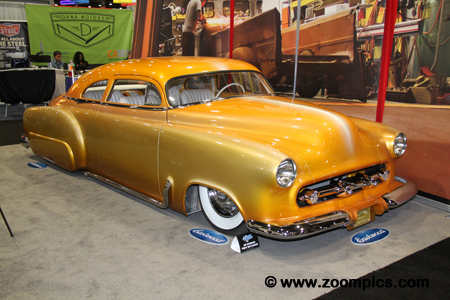 Appearing in the Eastwood booth, this lowered two-door 1952 Chevrolet is called, Desert Sunset. This Chevrolet features design elements often associated with Winfield � the blended/fade-away style of automotive painting and a chopped roof. This Nissan GT-R was shipped to the 2015 SEMA show from Japan. The Nissan is from Kuhl Racing. It has received some performance enhancements including - a wide-body kit and bigger wheels and tires. What sets this car apart for the GT-Rs is its appearance. This is not a wrap but its several thick layers of paint that have been taped, sculpted and then finished with metallic paint and a clear coat. It took the well known Ringbrothers shop three-years to construct this 1965 Ford Mustang Fastback called Espionage. Why so long - because the wide-body kit on the Mustang is constructed of carbon-fiber. The Mustang�s body panels can be purchased for $37,585. The car also features a 427-cu.in. LS7 engine with a Whipple supercharger � this combination is rated at 959-horsepower and 858-ft.lbs. of torque. 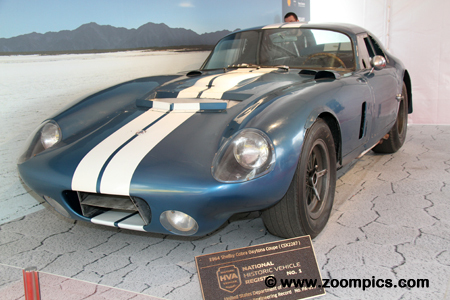 Every Cobra Daytona Coupe can be called historically significant but this one is particularly special. This Coupe was the first of six built and the only one constructed entirely in the U.S. Designed by Peter Brock this car has been driven by Bob Holbert, Phil Hill, Dave MacDonald, Innes Ireland, Bob Bondurant and Craig Breedlove. The car has been raced at Daytona, Sebring, Le Mans and set twenty-three records at Bonneville. Another Peter Brock car on display was the P70. In 1965, Carrol Shelby tasked Brock with designing a car that would compete in the Canadian American Challenge Series (Can-Am). 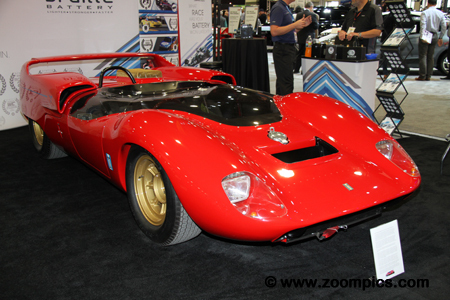 The P70 was constructed as a partnership between Shelby American and Italy�s De Tomaso. Unfortunately, the project fell behind schedule and was canceled by Shelby but not before two cars were completed. This Volkswagen inspired mini bus caught the eye of many show-goers. 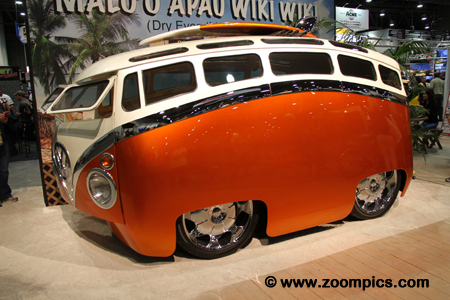 Built by Ron Berry of Utah, the �Surf Seeker� resembles a Volkswagen Type 2 bus. However, it is a custom made body which uses an engine from a Volkswagen. The flat-four motor has been upgraded and given a supercharger. 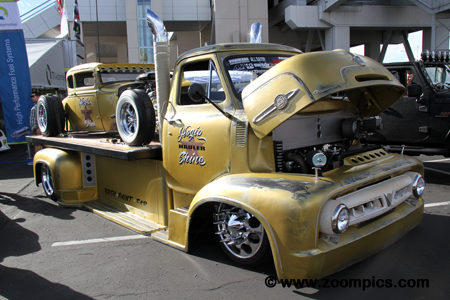 Not one but two vehicles built by Dan Hogan of Hogie Shine appeared in the parking lot of the Las Vegas Convention Center. Hogan brought a 1930 Model A and a 1953 Ford COE Hauler. The Model A has been chopped six-inches and channeled so that it fits on a specially constructed chassis and it is powered by a 351 Cleveland motor. The hauler is mounted on a modern Dodge chassis equipped with a Cummins diesel. 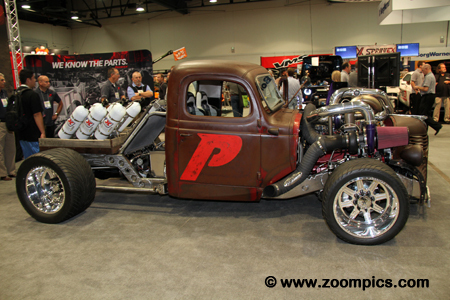 The Premier Performance Products� booth featured this truck called, Six Pack. How did the builder decide on that name � well the vehicle is powered by a six-cylinder diesel engine and is carrying six nitrous-oxide bottles in the rear. Two turbochargers have been added to the motor which helps it produce 965-horsepower and when the driver uses the nitrous, the horsepower climbs to 1,091. 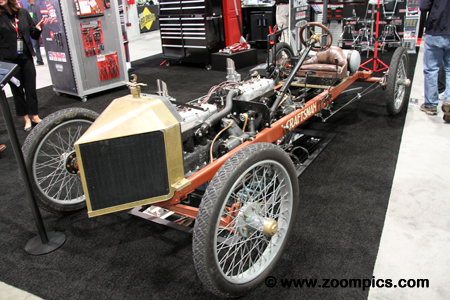 Tool manufacturer, Craftsman was responsible for commissioning this vehicle called the �Craftsman Racer�. The Craftsman Racer takes its design cue from Henry Ford�s 1902 Ford 999 racing car. It is fitted with two Model T engines connected at the crankshaft and produces approximately 80-horsepower. With inspiration from the television show, �Games of Thrones� this tube-frame wonder is called, Valyrian Steel. The vehicle which took 2,000-hours to construct was built for the annual Burning Man festival in Nevada. The Valyrian Steel uses an engine from the Ford Mustang GT � a 5.0-liter Coyote V8. 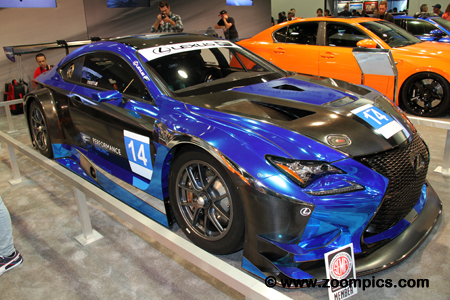 The Lexus booth showcased the Lexus RC F GT3. The plan is for Paul Gentilozzi and the newly formed F Performance Racing team to field the RC F GT3 in the 2016 IMSA WeatherTech Championship. This marks a return racing for Lexus which won three Grand-Am championships with Chip Ganassi Racing. The team�s lead driver has been identified as sports car veteran, Scott Pruett. The Equadoline was built at Gordy�s Garage in Las Vegas. It started life as a 1962 Ford Econoline Pickup. 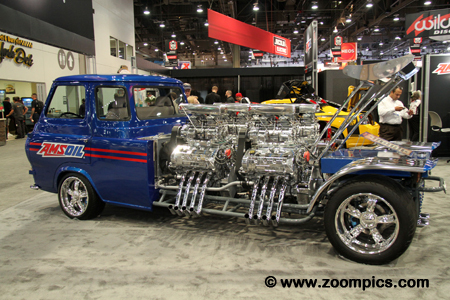 The bed was removed and a tube frame chassis was constructed to accommodate the four supercharged Ford 4.6-liter V8 engines � which are estimated to produce approximately 4,000-horsepower. The front and rear suspension have been replaced with components from a C7 Corvette. Mike Whiddett�s Mazda has undergone a significant transformation to compete successfully in Drifting events. The original four-cylinder engine has been replaced with a 26B Mazda Rotary motor. If that wasn�t enough, the engine�s performance has been enhanced with two Garrett turbochargers. With so little room left in the engine compartment, the exhaust protrudes through the hood. 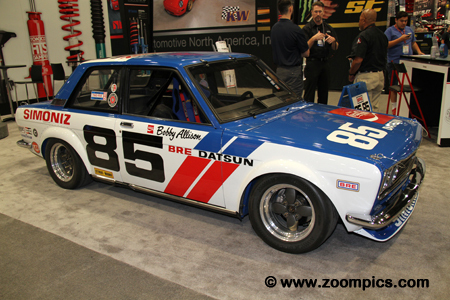 This is one of the very successful Brock Racing Enterprises Datsun 510s. The team competed in the under 2.5-liter category of the Trans Am series and won the championship in 1971 and 1972. 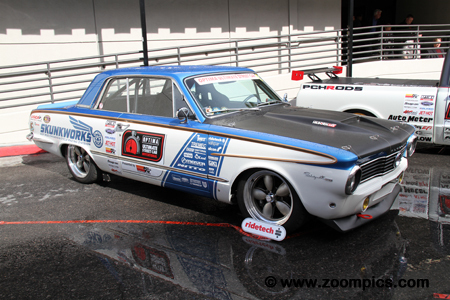 The team�s regular drivers, John Morton and Mike Downs were joined by guest drivers in the team�s third 510. This No. 85 was raced by Bobby Allison at Laguna Seca and is now owned by comedian, Adam Corolla. 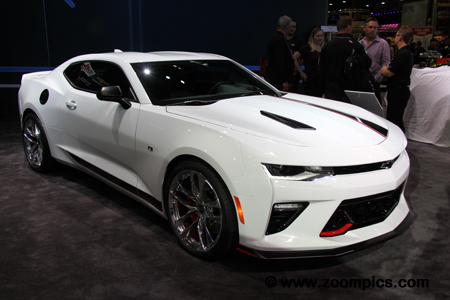 A sixth generation, 2016 Chevrolet Camaro was on display in the General Motors booth. This Camaro was equipped with many of GM�s new performance parts � resulting in the Camaro Chevrolet Performance concept car. Some of the upgrades include: Brembo brakes, a performance air intake, an upgraded exhaust system and a lowered suspension. Love it or not this pink Honda HR-V was difficult to miss. This is the latest creation from Kylie Tjin who has been producing concept cars for Honda since 2006. The HR-V has been equipped with larger brakes, wheels and tires. Tjin has fitted the Honda with a wide-body kit, performance exhaust system and an air suspension. On display in the Mobil 1 Oil booth was this 1956 Chevrolet Bel Air. This �56 Chev called, �Bela� was built by Retro Designs Speed and Custom from Concord, North Carolina. The car has the weathered outward appearance of a typical rat rod but the engine bay is immaculate and well-engineered. Bela is powered by an LS3 crate motor from General Motors which is equipped with a Vortech supercharger. All content (photographs and text) appearing on this website are the exclusive property of � www.zoompics.com and are protected under International copyright laws. The subject matter on this website may not be reproduced, copied, stored or manipulated.